Following a two year project exploring tax exemptions through a Cost Sharing Group (CSG) for universities which share equipment, the N8 Research Partnership has concluded that too many legal and financial hurdles exist. Funded by the Higher Education Funding Council for England, N8 universities have been working towards utilisation of a VAT CSE for equipment sharing through the development of an approved CSG model, legal agreements to implement a model and the practical demonstration and dissemination of learning from utilising the model. By utilising the N8 High Performance Computing capability as a model facility for implementing a CSG, it was hoped to demonstrate the value and viability using an existing shared asset. 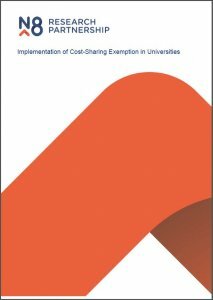 Each N8 university would need to establish a company as a cost sharing group (CSG) itself, and to have a membership/shareholding in each of the other CSGs set up by the remaining N8 member universities. Each N8 university would also be required to lease equipment capacity to its CSG; and in order to use the asset, the accessing university would need to purchase use from the relevant CSG. Additionally, each CSG would be required to have a clear membership structure in place. However an HMRC ruling that a CSG cannot exist within a VAT group means that a CSG has to be formed outside of a university’s VAT group, and any equipment leased to that CSG would incur a VAT charge, which negates the benefit of the CSG model and moves the VAT charge to elsewhere in the supply chain. Further, while there is interest in the CSG model from the university sector there is also an aversion to risk in the current climate and the current risks, uncertainties and costs of using the CSG model far outweigh the benefits of using the model. • Finalise the complex (and new) legal agreements required. • Obtain approval of CSG model by HMRC. • Implement the CSG model across the eight universities. • Develop a case study and disseminate to the wider sector. N8 found that it was not possible to achieve HMRC approval for a working scenario to implement a CSG which precluded N8 from providing advice on how universities can share assets within a CSG structure and make the necessary VAT saving, without exposure to risk of falling foul of future HMRC rulings. Discussions with N8 universities also found no appetite among N8 facilities to engage with a CSG model under the current restrictions. Direct reimbursement creates a financial situation which would be impossible to administer practically and the current approach to creating and managing a CSE is costly and bureaucratic for HEI-scale facilities. Dr Peter Simpson, director, N8 Research Partnership, said: “HMRC guidance currently does not encourage uptake of CSEs in Higher Education. This seems to run counter to the stated government and sector desires to increase HEI efficiency and to ensure optimised use of high cost equipment that in many cases is taxpayer funded. “Despite this, a way forward will need to be found because greater efficiency in Higher Education remains vital.